Like many other seemingly lucrative online money making schemes, Your Freedom Mentor also reaches the highest of the skies with its claims. I’ve therefore had many of my followers asking me for a Your Freedom Mentor review so I don’t want to turn a deaf ear to them. Personally, I’m hardly interested in reviewing this website but the problem is that I am on a mission to tell people the truth which these websites hate to reveal. If you’ve previously been tricked into something like this claiming over $1,000 a day you’ll probably know exactly what I mean. The video presentation for the system makes things highly appealing and some of the visitors will likely sign up without even checking if Your Freedom Mentor is a scam. Today, I’m going to reveal the truth by telling you how the likes of this system work. I’ll try my best to present the most striking facts about this system and whether you should join it or not. What Exactly Is Your Freedom Mentor? Your Freedom Mentor is a single page website with a primary focus put onto the promotional video. The page designer has smartly left empty space between the video and the disclaimer down below it. Why? I’ll reveal the secret later! Right under the system’s title, there is the closing date mentioned (as shown below). Surprisingly, when you arrive on the page it’s the last date for sign up. Wow, lucky to visit before deadline! Really? Well, the next interesting thing is that the system is available only to a limited number of members. The advertisement suggests that only 7 positions are remaining out of just 45. What you’re told you need to do is enter your name and email address and then hit Get Started Now! (but if you haven’t done that yet then I don’t recommend doing it & you’ll soon see why). The video begins with a statement demanding undivided attention which is then followed by a few people talking about their daily and weekly income which they’ve allegedly begun generating all thanks to the Your Freedom Mentor system. Then the presenter tells the viewers that even the video is also limited to exclusive viewers so if you’re watching it, you’re lucky! She then goes on to say that she can’t pay $1,000 to everyone on the internet hence why she’s implemented a restriction on the number of members. Like most of other promo videos, this one also keeps you guessing what exactly is it all about? The presenter claims to be a multimillionaire. During the video, the presenter also tells that if the video might shut down just because you’re late in signing up and the positions got filled. Then she moves on to the payment method and asks if you’ve a PayPal account because she loves paying through this secure system. Then she shows the screenshots of her own PayPal account (I have reasonable doubts). She claims that the purpose of offering this program is to expand her team. This is why, she says, she’ll pay you and tries to prove it by showing debit transactions from her PayPal account. No experience required and you don’t have to be a tech-guru! The installation of the system allegedly requires no more than 15 minutes. Is this all true? Well, let’s have a look! How Does Your Freedom Mentor Work? This is no different than many of other scam systems I’ve already reviewed. The claims are absolutely abnormal. The video, as always, is absurd. There is nothing new with the platform. It is a reproduction of some notorious systems such as the Income Elite Team. Your Freedom Mentor is a congregation of lies and false claims. It doesn’t really feature any legitimate money making program. There is nothing which could even earn you a $10 bill. The typical purchaser does not make any money using this system. yourfreedommentor.com does not guarantee income or success, and examples shown in this presentation do not represent an indication of future success or earnings. Well, what else could’ve opened our eyes than this disclaimer? Even this statement alone is enough to conclude a sweeping statement but let me hint towards some other facts. The testimonials in the video are actually paid. 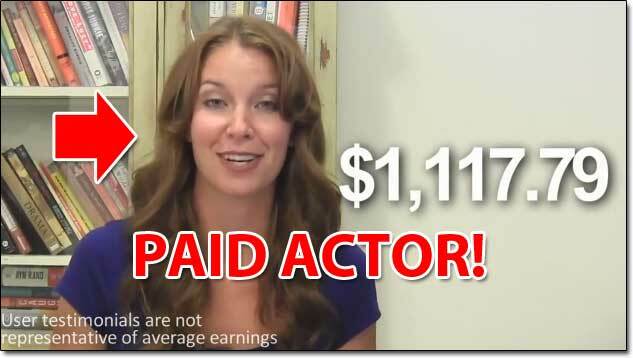 Most of the people featuring the video pretending to be the lucky earners are simply freelancers that have been hired from the website Fiverr. I’ve previously seen them offering their gigs on freelancing platforms as professional video creators, voice-over actors, and video editors. There is no doubt that they are really making money online and that they’ve also earned something from this system but only against their services to tell lies and make fake claims… Not actually thanks to the so-called “money making system” as they claim in the video. The statement which always surprises us by telling that it is the last date for sign up is actually updated every single day. The offer will vanish forever just in a couple of hours! The truth is that it is refreshed for the next day. There is no truth behind the limited number of membership. They are just using it as a scarcity tactic to trick people into signing up without really thinking about what they’re doing. 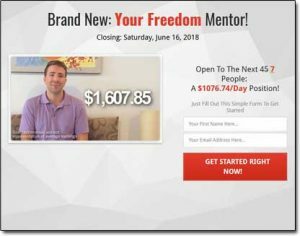 My Verdict – Is Your Freedom Mentor a Scam? Rarely do I feel confident of declaring a system a flat out scam, but it’s clear to me that the Your Freedom Mentor system is indeed exactly that. Nobody needs to ever consider this program as a potential money making opportunity as in reality it’s nothing but a promotional platform which advertises some sort of sales funnel to make the creator wealthy at your expense. It could also possibly distribute your email address to social media marketers & you just can’t trust any of the claims made in the demonstration video. The disclaimer itself found on the website is enough to tell the truth about how it all really works. The truth is though that there are actually several legitimate ways to make money online, and yes – you can even make a full-time income too… It’s just that it will never be as easy as the Your Freedom Mentor system claims. There is no way a system is just going to make lot’s of money for you on auto-pilot… If there was ever such a thing then nobody would be left working a job, the world would be in crisis. In reality it takes work to make money online, but the good news is that if you’re prepared to put in the work then there are programs like Wealthy Affiliate that will give you everything you need & show you how you can get started (the right way). So yeah overall as you can probably guess I am not going to be recommending the Your Freedom Mentor system because as far as I’m concerned it’s just a piece of junk that’s been designed purely to make it’s creator wealthy at your expense. Is Bitcoin Mentor Club a Scam? Read My Review Before Signing Up! 2 Responses to "Your Freedom Mentor – Scam System or Is It Legit? My Review Uncovers The Truth"
Hi Scott – I’m not quite sure how you think I can help you? 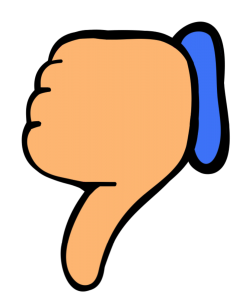 Did you read my review above? I have nothing to do with the Your Freedom Mentor system I was just writing a post to warn people about it. Obviously I hope you get your issues sorted, but I’m not the man that can help you – you’ll need to contact the people over at Your Freedom Mentor directly.